2018 was a busy, crazy, changing year for us. This years schedule is already making us crazy but we love it! The initial show dates had the incorrect dates for Dec Half Baked Show. We are the 2nd weekend in Dec and if we had looked at the 2018 Calendar and not the 2019 Calendar when we did this we would have been golden! The 3rd weekend is the KISSMAS Futurity and we did send our apology to Ms. Amy “Youngblood” Peoples for our error and we have corrected that on this show date page! The Rebel Soul has found a new home in 2019 in Michigan. 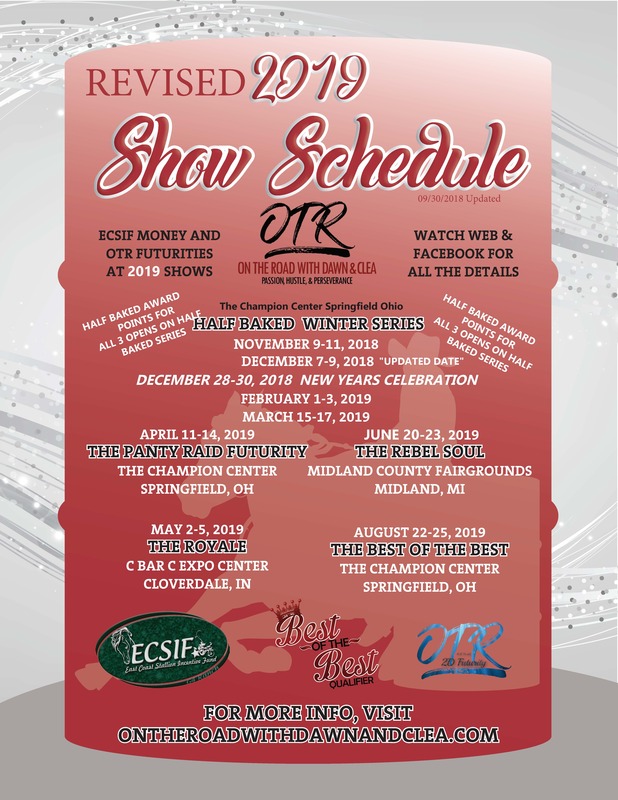 With the support of the MI NBHA and IBRA we are going to bring OTR to the great people of Michigan – The Crew will now travel for you all vs you always being on the road to get to us! We hope the PA/NY people can make this show with having to rehome the Rebel Soul. It is a great facility and we are excited to be there. We want to thank Brad and Patti Marshall in advance for reaching out to us and working together. That is always the BEST way, work together to try to make everyone as happy as possible! We are looking forward to bringing the OTR/IBRA / NBHA Approved show to Michigan! A word of advice – Remember – Look at the right year it saves time 🙂 Have a good one and we will see you On The Road! Half Baked Showbill will be up Tomorrow! Previous The Dust has settled and we are Thankful!